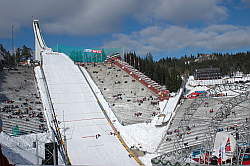 Every year there is a ski jumping event in Oslo, at the Holmenkollen venue. As I'm turning more and more Norwegian now (already been here for almost two years now) I could not let this slip. So together with some folks we drove to Oslo and walked up the hill to the venue. It's pretty impressive to see how high this hill they jump off actually is. Much more impressive then on TV. Normally Holmenkollen is always very foggy, but this year there was excellent weather: "warm" and sunny. We were a bit early so had to wait a bit but atleast there were some performances to get the audience going. Amazingly that seemed to work better than I expected. There were 50 participants and they started in the order they were ranked in FIS ' World Championship. After the first round the best 30 continue to the second heat where the best one from the first heat is the last man to jump. Adam Malysz won which didn't please the Norwegians too much (best Norwegian was 10th). There were a lot of Poles at the event though, and they were ofcourse quite happy. For more photos see my gallery .